Omnibus One is an oversized (8 ½” x 11”) trade paperback with a cover by Chuck Melville. It actually contains a bit more than the complete The Tai-Pan issues #1 (January 1992), and #2 (February 1992), which have been remastered and re-laid-out (though not without some new errors). There is early incidental artwork of the cast scattered throughout the book. Finally, a couple of items are shown from a preliminary version of #1 in March 1991 and out of print since then. Readers who have the actual first two issues will still want this compendium. The first 60 pages present the guidelines of the 36th century background (historical, technical, and economic) and the interstellar freighter The Tai-Pan and her crew, which the Project’s writers have used for their stories; in article form by Gene Breshears, Alan Chapman, Mark Davis, and others. The first fiction in this Omnibus are the following two short stories from issue #1, “What Tales He’d Tell” by Whitney Ware (illustrated by Arion Morgan) and “A Bird in the Hand” by Rachel Erlich (illus. by Nancy Robak). These are both all right but sleight; brief trifles introducing the Tai-Pan and four of her crew. “New Queensland Station” by Gene Breshears, Keith Alan Johnson, and Whitney Ware (illus. by Jackie Duram-Nilsson), a novella from issue #2, provides the real adventure in this book. “The Tai-Pan” has just arrived at New Queensland Station, the major space station circling the planet Aussland, to deliver an agricultural cargo, when a civil war breaks out. Both sides in the war want the freighter, the majority of the ship’s members are taken by surprise while on liberty, and within the first few pages over a dozen of the crew just introduced in the cast list are killed. The action is well-written military science-fiction, and it never lets up. The short stories from issue #2 are “Jumping Planet” by David Dailey (illus. by Diane Salts), and “Between a Laugh and a Tear” by Whitney Ware (illus. by Viki Sinex). The former is another tale of how The Tai-Pan gets one of her crew, while the latter is a somber followup to “New Queensland Station”. The omnibus closes with the two brief outtakes from the preliminary version of issue #1. 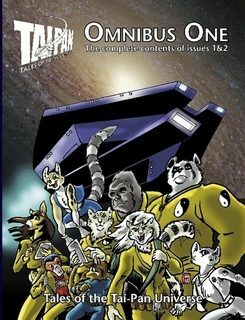 This Omnibus One is a great sampler of the oldest continuing publication in Furry fandom. The opening pages describe the stories’ background in detail, while the stories themselves present the earliest adventures of Captain Marko Rasputin (panda), cargo master Eli (raccoon), computer techs Te Teko Bush (tree kangaroo) and Frith (ferret), general crewman Chester (ringtail), cook Cory DuPlessis (wolf), and a couple of dozen others that regular readers of the Project’s fanzine will consider old friends. The other artists represented by full-page or spot illustrations include Terrie Smith, Kristin Fontaine, April Lee, Joyce Norton, Tom Milliorn, Roy D. Pounds II, and many others. A collection of the best of Tales of the Tai-Pan Universe has been overdue for years; the decision to reprint the entire issues in Omnibus volumes is just as good. Fred, could you please write your articles in a way to make them understandable to someone who NEVER HEARD OF THIS? i thought that this WAS written to be understandable to those who had never heard of "Tales of the Tai-Pan Universe". What is vague about it? Is it one long story in a shared universe written by different people? Is it a shared universe with different stories by different people? Are volumes 1&2 the only ones to get made? [a] shared-world Furry space-opera fanzine, set in the 36th century against an interstellar background, with a group of writers and artists featuring the same Furry characters in stories edited to be mutually consistent. Its publication, titled The Tai-Pan under Whitney Ware and Tales of the Tai-Pan Universe under Gene Breshears, is published approximately twice a year; issue #49 is scheduled for November 2011. You just need to slow down and read every word, or at least most of them. The various WikiFur links provided might also help. They have various single issues available for sale; each is a separate collection of stories and artwork. The original issue #1 is out of stock, which is probably one reason they have published this special omnibus edition combining #1 and #2; they only print so many of each. Issues are in the upper tens of pages. Sorry, Mister Twister, but Green Reaper got you with "slow down and read every word." Also, respect your elders, man. Stop bothering Fred. You should look at it as your greatest accomplishment on Flayrah he replied to you. I am sorry, oh wise one! The Tai-Pan website, which is linked to this review, has under its Buy This Merchandise section this Omnibus One and the individual issues #2 through #48 (with the covers shown and the contents listed) for sale. As the review says, issue #49 is scheduled for November. For those who don't want to buy the individual issues, they will be combined in future Omnibus volumes, although how often the Omnibuses (Omnibi?) will be issued and how many issues will be in each has not yet been announced. Well, that cleared things up.